Fargo is intense and dark and raises more questions than one would usually be comfortable with, says Paloma Sharma. Screenwriter Noah Hawley, who gave us Bones, adapts the Coen brothers’ 1996 critically acclaimed hit film, Fargo, of the same name and brings it to small screen audiences on Colors Infinity channel. Fargo stars A-list actors such as Billy Bob Thornton and Martin Freeman and has already completed a season overseas with a second season scheduled later this year. In India, however, the series completed six episodes on Sunday night. Fargo, the series, does not exactly expand Fargo, the film, into a TV movie, instead making changes to the film for the better. 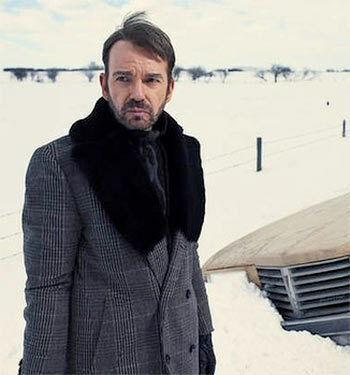 The series examines the changes that a drifter named Lorne Malvo (Billy Bob Thornton) makes to the sleepy, uneventful town of Bemidji. He is an exceptionally intelligent individual who uses his gift to lie and manipulate and, every now and then, kill. After being involved in a minor car crash, Malvo is taken to the hospital where he meets local insurance salesman, Lester Nygaard (Martin Freeman). Earlier that night, Nygaard had run into Sam Hess. One learns that Hess bullied Nygaard when they were in high school and upon meeting him again; Hess punches Nygaard in the face and breaks his nose, which results in Nygaard landing up at the hospital. Upon meeting Malvo, Nygaard discloses his hatred of Hess to him, to which Malvo suggests that Hess be murdered. Nygaard doesn’t agree to the Malvo’s proposal but doesn’t say no to it either. Soon after their meeting in the hospital, Malvo murders Hess and Nygaard is implicated as the two were overheard talking about it. The show documents Nygaard’s struggle to escape Malvo’s trap -- following other subplots in the form of Malvo’s other victims -- and with each move he makes, the rope around his neck tightens further. Fargo is not an easy watch. It is intense and dark and raises more questions than one would usually be comfortable with. It demands patience and extracts vengeance in the form of torturous boredom when faced with those who seek fast paced, non-complicated thrills. With the Coen brothers acting as executive producers on Fargo, it does not stray far from the themes that the film chose to explore: good and evil and everything else in between. There is an otherworldly shadow that passes over one’s television screen every now and then, turning the focus of the beam of doubt within. A show that carefully examines the darker side of human nature, Fargo is brutal and relentless. The story will have no mercy on its characters, no matter how cruel it may seem. Set against the frozen landscape of Bemidji, Minnesota, Fargo is as cold, as severe as the ice that acts as a stage for the events of the story to play out. Starring with what is perhaps the most solid cast of actors seen on TV in recent times, the show is wonderfully visualised. The scene in episode four where Nygaard, dressed in a bright orange jacket, runs through the stark, grey woods stands as a testament to this. Although lacking any memorable (or detectable) soundtrack, the show is for those who sit up late at night in their armchairs and ponder the mysteries of the human mind. Certainly not for the faint hearted, Fargo will make you revisit your demons.